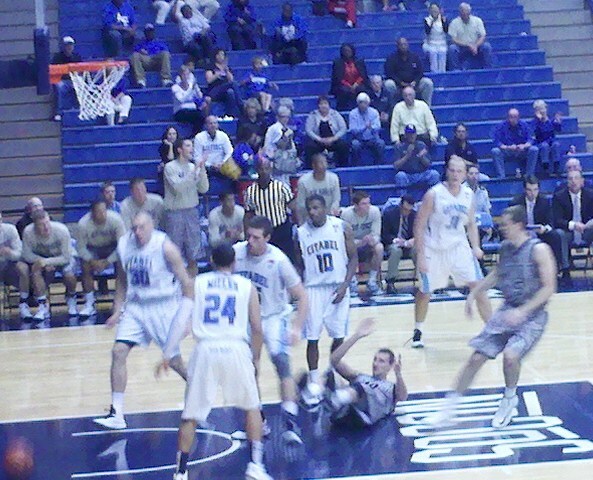 – Biggest positive from the 2012-13 campaign: The Citadel swept Furman! After a 6-24 season in 2011-12, there was a belief that The Citadel would substantially improve on the hardwood last year. That didn’t happen. While there was a modest two-game upswing in both The Citadel’s overall and league records, that was largely due to a slightly softer out-of-conference schedule and a down year in hoops for the Southern Conference as a whole. Make no mistake, last season was a significant disappointment for the Bulldogs. Note: the statistics in this section do not include the two games The Citadel played last season against non-D1 opponents. The Bulldogs had enormous defensive problems. Per KenPom, The Citadel ranked 346th in adjusted defensive efficiency last year, ahead of only one other Division I team, Grambling State (which had a historically awful season). The numbers on defense were bad across the board. The Bulldogs could not control the defensive glass (bottom 25 nationally), had no shotblocking presence (bottom 25 nationally), and weren’t particularly good at forcing turnovers as a team, all of which led to an opponents’ eFG of 55% (bottom 10 nationally). Teams shot well against The Citadel from inside (53.6%) or outside (38.2%). Most of the damage, though, was done in the paint. Not surprisingly, when the Bulldogs defended fairly well, they were much more likely to win. The Citadel’s three best defensive performances against D-1 teams all resulted in victories. The Bulldogs only won once when they finished a game with well below-average defensive numbers (a ludicrous comeback victory at Furman). The Citadel’s offensive numbers weren’t good, either, almost entirely because of an alarming tendency to throw the ball away. The cadets committed 436 turnovers last year in their 28 games against D-1 competition, averaging 15.6 per game, a particularly high number given the number of possessions involved (less than 65 per contest). Almost one out of every four Bulldog possessions ended in a turnover. Only thirteen teams in the entire country had a worse turnover rate. It wasn’t just about the amount of turnovers, either. The types of turnovers committed hurt the Bulldogs too. The Citadel was victimized by steals at a rate higher than all but three other teams in Division I. That clearly had an impact on the defensive end, as teams were often able to convert those steals into easy transition baskets. The Citadel will now begin a new season without its best player over the past two years, Mike Groselle. Someone (or multiple someones) will have to replace his offensive productivity (including an eFG of 57.4% while taking almost 28% of the team’s shots). The other senior on last year’s squad was graduate student Stephen Elmore. In spot duty (13.7 minutes per game), Elmore provided a little muscle and some defensive rebounding. The Bulldogs suffered a very tough blow with the loss of junior forward P.J. Horgan, a solid presence in the frontcourt whose basketball career has officially ended because of back problems. Horgan would have been a sure-fire starter if he had been healthy. There is also a possibility that The Citadel will be without the services of 6’7″ forward C.J. Bray, who missed almost all of last season with an ankle injury. Bray now has nerve damage in his arm. If Bray is unable to recover, the Bulldogs would be essentially bereft of experienced frontcourt players. For a team that already struggled to defend the post, it could be a recipe for complete disaster. That is what can happen when a program struggles with attrition issues. There are no seniors on the Bulldogs’ roster this year (not counting Dylen Setzekorn, an academic senior who from a varsity athletics standpoint is a redshirt sophomore). Every recruit signed by Ed Conroy as part of his last recruiting class at The Citadel is gone. Also no longer at The Citadel are two of the four post players signed by Chuck Driesell in his first class — and of the two who stayed, one is no longer on the roster (Horgan) and the other is injured (Bray). Driesell did not sign a PF/C type for his second class. Lawrence Miller (who had just completed his sophomore campaign) and Janeil Jenkins (a freshman last year) also left school after the 2012-13 season. Both of them were guards. While they won’t be missed as much as the frontcourt players, their absence will certainly not help. The Citadel only has eleven players on its roster this season (and that includes Bray). As a result of those personnel losses, this year’s freshmen will be expected to contribute right away. I think it’s tough to ask true freshmen (particularly at The Citadel) to take on such a significant load, especially those who will have to match up against older, bigger players close to the basket. Driesell has no choice, however. – Marshall Harris III returns as the starting point guard for the Bulldogs. Harris did a fine job distributing the basketball last season (a top 60 assist rate nationally) but committed too many turnovers, particularly for a pass-first PG (Harris had more assists than field goal attempts last season). If he can cut down on the turnovers and elevate his shooting percentage (a woeful 29.9% last year), Harris could be a major plus for the Bulldogs. That possibility isn’t out of the question, as his totals improved markedly from his freshman to sophomore seasons. Harris averaged an assist every 7.8 minutes and a turnover every 9.2 minutes in 2011-12; in 2012-13, he picked up an assist every 5.8 minutes while committing a TO every 11.9 minutes. He also managed to get to the foul line on a regular basis, one of the few Bulldogs to do so. – Raemond Robinson missed the first eleven games of his freshman season while recovering from a broken foot. That may have set him back a bit last year, but he still had his moments. If The Citadel is going to outperform its projections this season, it will need surprising performances from several players, and Robinson is as good a breakout candidate as any. In limited action, he shot 43% from beyond the arc. The former Goose Creek High football/basketball star is a solid passer and is also capable of picking up a few steals here and there. Like most of the Bulldogs, he needs to lower his turnover rate. I would also like to see a bit more boardwork from Robinson (and The Citadel’s guards in general, as the backcourt players did not get their fair share of rebounds last year). – Ashton Moore leads all returning Bulldogs in career points, with 394. Last season, he started exactly half of The Citadel’s 30 games, and played just over half of the minutes available. Moore and Mike Groselle were the only rotation regulars to post respectable turnover rates. Moore is more of a scorer than a shooter, and to be successful this season he needs to get to the foul line a lot more often than he did last year. Some observers believe that Moore would be at his best providing an offensive spark in a sixth-man role, a la Vinnie “The Microwave” Johnson or Jason Terry. One somewhat curious factoid about Moore: he had fewer fouls per forty minutes than all but five players in the country last season. He only picked up three fouls in a game once. That happened at Furman, and it was arguably Moore’s best game of the season. – Quinton Marshall was a late signee for Chuck Driesell last year. The native of Raleigh showed off his athleticism at times during his freshman season. He’s not afraid to dunk. Marshall is a big guard with the ability to score inside. If he can develop a specialty, perhaps becoming a defensive stopper, Marshall could see more playing time (he appeared in 23 contests last season, averaging 11 minutes per game). – Dylen Setzekorn redshirted during the 2011-12 season, but that doesn’t mean he wasn’t busy. In his freshman year at The Citadel, Setzekorn took 40 hours of classes over two semesters. Forty hours as a knob is…a lot. Last year, Setzekorn took 46 hours — and also played in 28 games for the Bulldogs, averaging 10 minutes per contest. He’s a slender 6’7″ jump shooter who will light it up in a hurry if someone don’t get a hand in his face (11 points in 13 minutes against Furman, 13 in 18 minutes versus Wofford). He’s not an ideal one-on-one defender, but Setzekorn can help the Bulldogs in certain matchups, particularly if he can take advantage of his height and collect a few more rebounds. – Warren Sledge is one of four freshmen on the Bulldogs’ roster. A 6’3″ guard, his bio on the school website states he was “known for his solid defensive presence” in high school. If true, he could break into the rotation sooner rather than later. One thing Sledge has going for him is that he is a native of Keller, Texas. The Citadel has had a lot of luck with players from the Lone Star state in recent years. Among the Texans to have played for the Bulldogs: Cameron Wells, Zach Urbanus, and Mike Groselle. – Matt Van Scyoc occasionally struggled last season, like a lot of freshmen. He would sometimes take bad shots. He had three games in which he committed 5+ turnovers. When the dust cleared, though, Van Scyoc had put together an excellent first year, and was named to the SoCon’s all-freshman team. He had an eFG of 53.7%, helped by shooting 37% from three-point land. The 6’6″ swingman wasn’t afraid to hit the boards, blocked a shot every now and then, and had just a bit of an edge to his game. This year, Van Scyoc should be the main man for the Bulldogs. The better he is, the better off the team will be. Van Scyoc needs to shoot more free throws, avoid high-turnover games, and grab a few more offensive rebounds. There is a good chance he can, and will, do all those things and possibly more. I really wanted to go someplace where I could make a difference. The Citadel is one of the few schools that has never been to the NCAA tournament. Winning hasn’t happened a lot here, and to be able to help them do that, that would be big for me. I like that quote. I like it a lot. – At this point, the status of C.J. Bray for this season is uncertain. It would be a big lift for the Bulldogs if he is able to contribute. Two years ago, Bray started 18 games for The Citadel and was particularly effective on the defensive glass. He also showed flashes of a nice inside-outside game. Bray is athletic enough to have been offered a football scholarship by Arkansas. – The Citadel’s basketball team traveled to Canada in August and played three exhibition games against Canadian universities. Perhaps the most intriguing performer in those three contests for the Bulldogs was freshman forward Brian White. White is only 6’6″, 180 lbs., but early returns suggest he plays “bigger” than his size. As Van Scyoc noted, White “doesn’t look the part but he can get it in there and mix it up”. – Another freshman post player who will get a chance to show his stuff is 6’8″ Dutchman Tom Koopman. I don’t know anything about him, but Chuck Driesell says Koopman “enjoys playing defense”, so he has that going for him, which is nice. Total consciousness for Koopman is sure to follow. – Nate Bowser is a 6’9″, 210 lb. forward/center from Fort Worth. I am not sure if the original plan was to redshirt him (or Koopman) for this season, but the loss of Horgan probably ended any chance of that happening. Like Sledge, Bowser is from Texas, so there is decent karma potential for The Citadel. Also, “Nate Bowser” is a great name for a menacing power forward. To become truly menacing, however, he probably needs to gain some weight. The Citadel’s non-conference schedule includes road games against BCS opponents Nebraska, Tennessee, and Wake Forest, along with two in-season tournaments. The Bulldogs will again compete in the All-Military Classic, a non-exempt tournament featuring The Citadel, VMI, Army, and Air Force. This year, VMI is hosting that event. Towson is hosting the “mainland” portion of the Battle 4 Atlantis. That tournament struggled to find D-1 opponents to play in the side event, which means the Bulldogs will play a neutral-site game against West Alabama, a Division II team. Other teams of note that The Citadel will play out of conference: Navy and Radford (both on the road), and College of Charleston, Presbyterian, and Gardner-Webb (with those three schools coming to McAlister Field House). West Alabama is one of four non-D1 squads that The Citadel has on its schedule, which is at least two non-D1s too many. 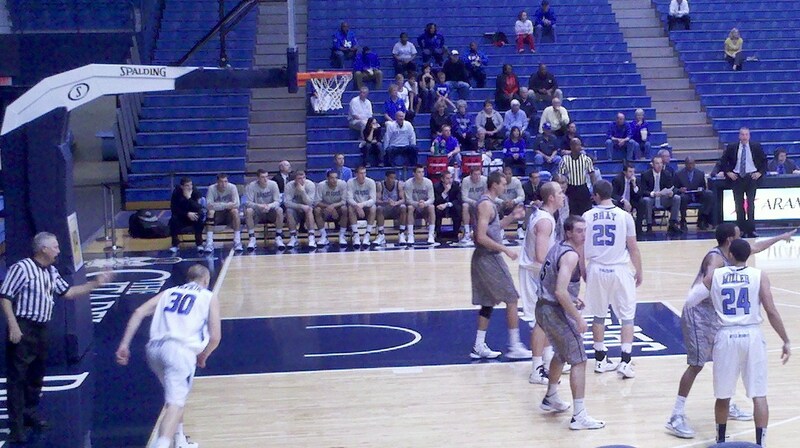 It should be noted, however, that the military college is far from alone in filling out its home slate with such teams. SoCon schools are playing a total of 32 non-D1 opponents in 2013-14, averaging just under three per school. Last season there were only 18 such matchups in the league (not including the CofC). Clearly, the increase in non-D1 scheduling is partly about trying to fill out a home schedule as a low-major, with the reduction of the SoCon’s league schedule to 16 games probably a factor. I do wonder, though, if the conference is trying to “game” the RPI to a certain extent. The Citadel was picked to finish last in the Southern Conference by both the league’s coaches and media members. It is hard to argue with that collective assessment. The Bulldogs lost their top scorer and rebounder from a team that finished next-to-last in the league last season. There is a possibility that the Bulldogs’ 4 and 5 spots will be manned almost exclusively by freshmen. In addition, the defensive woes for last season weren’t just a blip, but a pattern. The Citadel has been very poor on defense throughout Chuck Driesell’s tenure at the school, ranking 314th, 294th, and 346th nationally in defensive efficiency (per KenPom) in those three seasons. Best-case scenario for the Bulldogs: the team’s turnover rate recedes to the national average. Matt Van Scyoc becomes an elite SoCon player, and at least two of his teammates become major offensive forces as well. The freshmen prove to be tougher-than-expected interior defenders, and The Citadel’s defensive eFG declines dramatically, falling to 48%. A raucous crowd at McAlister Field House cheers on the cadets to victory after victory. Whenever Tom Koopman scores, the Bulldogs’ radio play-by-play man Danny Reed yells, “Koop with the hoop!” as love-struck CofC co-eds throw tulips in the air to show their appreciation for the Dutch sensation. Worst-case scenario for the Bulldogs: the team remains unable to stop opponents from scoring at will. C.J. Bray is unable to play. The Citadel struggles in and out of conference play, and its win total from last season is cut in half, from eight to four. I think it’s fair to say that The Citadel’s fan base is skeptical that the best-case scenario outlined above will come to pass. That is completely understandable. However, games aren’t played on paper. The Bulldogs have an opportunity to prove a lot of people wrong. Since my last post on The Citadel’s basketball team, the Bulldogs have played four games. One of them was a victory (! ), which broke a 12-game losing streak. Alas, The Citadel has dropped two games since then. This isn’t going to be a long post. I just have a few brief comments on the recent action. Okay, so Davidson is good and the Bulldogs are something less than good. Also, this game was at Davidson. Still, there is no excuse for any D-1 team not based in Lincoln Parish to average less than 0.6 points per possession for an entire game, as The Citadel did in this contest. 64 possessions, 38 points. Yeesh. Davidson didn’t even shoot particularly well, and still won going away (and then some) thanks to 26 Bulldog turnovers, which when combined with 31% FG (3-11 from 3) resulted in an offensive debacle. The less said about this game, the better. Georgia Southern is the most SoConnish of all SoCon hoops squads, as this game came immediately after the Eagles had beaten Davidson and the College of Charleston in back-to-back contests. GSU whipped the Wildcats by 13 points and held the Cougars to 34% FG, but could not stop The Citadel’s offense. The Bulldogs followed up a 0.59 ppp performance with a 1.23 ppp effort against the Eagles (70 points on 57 possessions). The Citadel scored more than twice as many points per possession against GSU as it did against Davidson. That may be the biggest differential in consecutive D-1 games for any team in the country this season. Mike Groselle and Matt Van Scyoc combined for 35 points on only 19 shots, and there were several other efficient individual offensive performances. The Bulldogs did not shoot the ball very well (37% FG, 22% 3FG), and when combined with being badly outrebounded (48-29), The Citadel didn’t stand much of a chance. Chuck Driesell mentioned the rebounding; I want to mention the foul disparity. With less than three and a half minutes remaining in the game, Mike Groselle had the same number of fouls as the College of Charleston’s entire roster: 4. I’m not sure what to make of that. Simple format: Four teams, two days, two games per team. The College of Charleston, The Citadel and Charleston Southern are locked in every year. S.C. State makes for a fine fourth, or rotate that spot with other state schools. The Citadel is already committed to one in-season non-exempt tournament every year (the All-Military Classic). Playing in two of them would likely be problematic when trying to put together a manageable schedule. We’ve already seen how less-than-ideal scheduling can have a negative impact on a season (the all-road December slate). Besides, The Citadel should be aiming for an exempt tournament (like the Charleston Classic), not one that just takes up two more games on the schedule. It seems pointless to hamstring the program for the benefit of a “local” tournament that may not appeal all that much to the locals anyway. The Citadel can play the CofC and/or Charleston Southern every year if (and when) it wants to do so. It doesn’t need a tournament setting, with the resulting scheduling problems, to do that. I was annoyed that The Citadel could never tie or take the lead. I was annoyed that the Bulldogs missed a layup that would have tied the game midway through the second half, which was immediately followed by an Elon three-pointer. I was annoyed by Elon’s offense, which consisted of a lot of screens (some of which were legal) to set up three-point shots (32 of the Phoenix’s 59 field goal attempts were from beyond the arc). Most of all, though, I was annoyed by the Cub Scouts. Yes, the Cub Scouts. There was a promotion for scouts and their families for this game. To be fair, most of them spent the afternoon goofing around with each other, eating large quantities of cotton candy. During the second half, however, four little miscreants decided it would be fun to stand in the corner rafters and shriek at Bulldog players as they attempted free throws. I should say that it’s possible two of them were not scouts, as they weren’t in uniform (two of them were). I thought about walking up there and suggesting that they could do something else with their time, but it was obvious nobody was going to get through to them, particularly the apparent ringleader — heavy-set, wearing a white t-shirt and sporting a Harpo Marx hairdo. At least Harpo had the grace to shut up in public. The Bulldogs have been close in several of their losses (Elon, CofC at McAlister, Samford, Chattanooga). However, there is a big difference between being close and finishing the job, and that’s the step the team must now take. The Bulldogs face a stretch of winnable games: Wofford, at Furman, at UTC, at Samford, Georgia Southern. Sure, some of those are on the road, but The Citadel’s win in Statesboro shows that the Bulldogs are more than capable of winning league games away from home. I will be very disappointed if the Bulldogs don’t put something positive together over the next two weeks. It’s time to start winning. The Citadel split its two games, beating VMI 84-76 on Saturday and losing to Air Force 77-70 on Sunday. I was at the latter game, along with luminaries like Len Elmore, Paul Maguire, Harvey Schiller, and the biggest celebrity of them all, General. Bulldog basketball is a hot ticket this season. Well, statistically we’ve charted it…and [determined that] it’s our most successful defense. Indeed. That explains in part why The Citadel never gave up on the zone against Air Force, a decision I would not be inclined to criticize despite the Falcons’ hot second-half outside shooting. 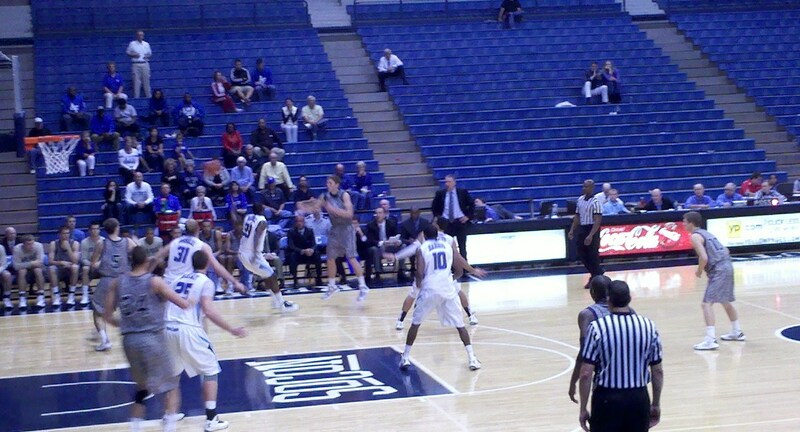 Considering its personnel, The Citadel probably won’t fare too well playing man-to-man defense against most opponents. If a team gets hot from outside on a given night, the Bulldogs are just going to have to live with it. Groselle had his 23rd career double-double against VMI, scoring 21 points and corralling 15 rebounds. He was his usual efficient self, only needing 11 shots to get those 21 points and committing just two turnovers. Against the Keydets, Groselle got help from Harris (19 points, 9 assists) and freshman Matt Van Scyoc (17 points, 7 rebounds). The Citadel had a 25% turnover rate against VMI, a statistic that usually would result in a loss. However, the Keydets’ helter-skelter style leads to lots of turnovers and lots of points, usually for both teams, as VMI is not a strong defensive squad. VMI did not shoot well against The Citadel’s 2-3 zone, particularly from inside the three-point line (13-31), and when the Keydets aren’t shooting well, they aren’t winning. The turnover rate for the Bulldogs against Air Force was 27%, and The Citadel paid for it. Although the Bulldogs actually led the game at halftime (30-28), in my opinion that was the half that cost The Citadel the win. Air Force was within two points at the break despite shooting 9-27 from the field and being outrebounded 20-9. The Falcons actually led for most of the first half, thanks to eleven Bulldog turnovers. Thirty possessions, and eleven gone to waste. Some of them led to easy baskets for Air Force, too. The Citadel averaged 1.58 points per possession in the first half when a turnover was not committed. If you just cut the actual number of TOs in half, say from eleven to five, a similar rate of offensive success would have resulted in an additional nine points (9.47, actually, but I’m rounding down). The Bulldogs could have been up double digits at intermission, and that may have allowed them to withstand Air Force’s three-point barrage in the second half. The Falcons were 10 of 17 from beyond the arc in that stanza, including several from the left corner. I wanted the uniformed cadet in charge of securing the baseline on that side to hit one of the shooters with her waistbelt, just to see if it would throw them off. Lawrence Miller had a good game for the Bulldogs, making six of his nine three-point attempts for a career-high 20 points, and CJ. Bray played very well (14 points, 5 rebounds). However, after an impressive debut the day before, Van Scyoc had a nightmarish game against Air Force, one filled with turnovers. Freshmen are going to have games like that, especially early in the season. I will say that in person, Van Scyoc looks like a player. He is a legit 6’6″ and no beanpole, either. He should be able to mix it up in the SoCon without any problems. Another freshman, Quinton Marshall, had some good moments on Sunday and also looks physically ready to play at the D-1 level. 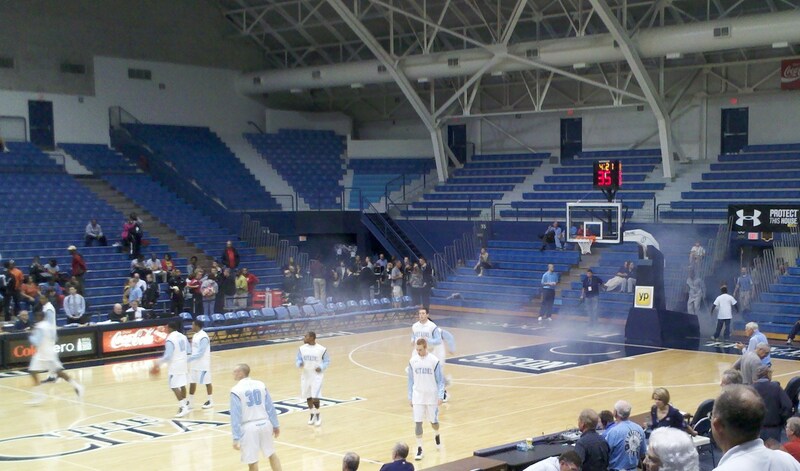 – The Bulldogs entered the court prior to pregame introductions through a veil of smoke. At least, I think that was the idea. – All-Military Classic t-shirts were given away at the game. After every other timeout, one of the game administrators would throw a bunch of them into the crowd. I didn’t get one, but as it appeared the t-shirts were roughly the same size as my cellphone, it was probably just as well. – VMI coach Duggar Baucom’s “I’m really angry” walk/stalk to the locker room at halftime of the Army-VMI game was a thing of beauty. Next up for the Bulldogs are two non-Division I teams, Montreat (on Wednesday night) and Union College of Kentucky (Saturday night). I’m not crazy about playing non-D1 schools, but I understand that the team needs to continue to develop confidence, and winning games is part of that development. It’s also a chance for Chuck Driesell to tinker with his rotation and figure out who is going to be able to help the team once SoCon play rolls around. As for the games themselves, I’m not too worried about them. I don’t foresee a Francis Marion situation; we no longer live in Dennisian times. Montreat is coming off an 86-54 loss at Appalachian State, and I think the Bulldogs could be better than App State this season. The Cavaliers have also lost to Webber International and Ave Maria. Union College (also called the Bulldogs) looks like it may be a little better than Montreat, as it is currently on a four-game winning streak. 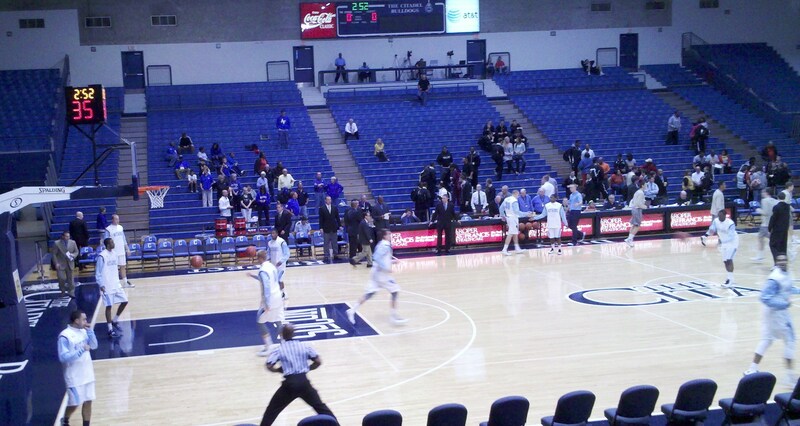 One of its victories came against Cincinnati Christian, a school The Citadel has faced on the hardwood before. I fully expect The Citadel to be 3-1 when Radford comes to town on November 24. It better be 3-1. There were three topics (attendance, polls, and ratings) that I wanted to discuss in more detail but couldn’t quite fit into the preview. I’ve decided to write about them next week in a followup post. The Citadel was 6-24 last season, 3-15 in the Southern Conference. Thus, it surprised no one that in the SoCon preseason polls (media and coaches) the Bulldogs were picked to finish last in the South division of the league. Indeed, The Citadel received fewer votes than any team in the league, in either division. The last time The Citadel finished dead last in both preseason polls was prior to the 2008-09 season. The Bulldogs had gone 6-24 the previous year, in head coach Ed Conroy’s second season at The Citadel. More of the same was expected, but instead the Bulldogs won 20 games for only the second time in school history, 15 of them coming in league play. It was the finest season on the hardwood for The Citadel in 30 years, and one of the best in school history. Just like Ed Conroy in 2008-09, Chuck Driesell is entering his third season in charge of the Bulldogs after enduring a 6-24 campaign. Conroy brought in eight scholarship freshmen for his second season; so did Driesell. However, there are differences between then and now. Conroy’s batch of freshmen included a player who would be named Freshman of the Year in the Southern Conference, Cameron Wells, and another (Zach Urbanus) who finished the year as a solid contributor. None of the freshmen who played last year for The Citadel (two were redshirted) had a season as good as Wells’ initial campaign for the Bulldogs. That isn’t to say that significant improvement can’t be made. I suspect it will. However, the same can be said for the Southern Conference in general. I expect the league to be better than it was last year, as many of the better players from last season are returning in 2012-13. It’s only one statistical category, but I couldn’t help but notice that ten of last season’s top thirteen SoCon performers in Ken Pomeroy’s “offensive rating” system (minimum 20% possessions used) are back this year. That group of ten doesn’t even include established performers like Trevis Simpson, Lucas Troutman, Trent Wiedeman, and a couple of Cochrans (Wofford’s Karl and Davidson’s Nik). The league is going to be tough this year. Can the Bulldogs hang in there? If they are going to do so, they must first address some obvious shortcomings. The Citadel was a very poor defensive team last season. Mike Groselle was the only consistent rebounder on the squad (though he was good enough to lead the league), and only three teams in all of Division I allowed opponents to shoot a higher percentage inside the arc (55.7%) than the Bulldogs. That carried over into league action, although The Citadel wasn’t the worst defensive outfit in the conference in SoCon play, in part thanks to opponents’ three-point shooting (only 30.3%). Three league teams allowed more points per possession than did the Bulldogs in conference games. However, the Bulldogs struggled on the offensive side of the court in conference play more than any other SoCon team, and by a wide margin, scoring only .907 points per possession in 19 league games (18 regular season matchups plus the first round of the SoCon tourney). The Citadel shot just 31% from outside the three-point line in league action and also had the worst turnover rate in the conference. One positive: when the Bulldogs did score, it often came as a result of good team passing (The Citadel was second in the league in its ratio of assists to made baskets). Mike Groselle had an outstanding season in 2011-12. Groselle led the league in rebounding and was second in scoring, being edged for the SoCon scoring crown by UNCG’s Trevis Simpson (who attempted 151 more shots from the field). Groselle was a very efficient performer (59.1 eFG%), and persevered despite being the focus of every opponent’s game plan. He did everything well, basically, and made the 10-man all-conference team selected by the league coaches. However, Groselle did not make the media’s All-SoCon first team, an omission that was not easy to understand. For the Bulldogs to improve this year, Groselle is going to need help. Will he get any? When I watched The Citadel’s freshmen in action last year, I came to the conclusion that while several of them had promising skill sets, they just weren’t strong enough to handle the adjustment to Division I hoops. There is a chance that a year of physical maturity (and a lot of work in the weight room) will improve the Bulldogs’ rebounding numbers and alleviate some of the turnover problems that plagued the team last year. C.J. Bray is a good example. The 6’7″ Bray is athletic enough to have been offered a football scholarship to Arkansas, and he can present matchup problems with his ability to float outside and hit the three-point shot. I thought he showed good instincts on the boards, too, but he wasn’t able to corral every rebound chance that came his way. That may change this year. If he can also provide solid post defense, he will be a great help to Groselle. Bray started more games than any other Bulldog freshman last season (18). Another rising sophomore who goes by his initials, 6’8″ P.J. Horgan, saw limited action last year and may also be a factor in the frontcourt rotation. Lawrence Miller shot 42% from three-point land last season, better than his overall field goal percentage (39%). 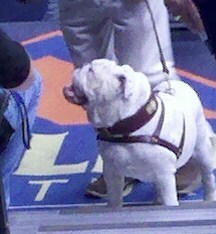 He will probably get first crack at the 2-guard spot for the Bulldogs. Ashton Moore, who started 14 games last season and played more minutes than any other freshman, will also be in the mix. Moore is capable of putting the ball in the basket (30 points against UVA-Wise) but needs to be more consistent. The point guard for The Citadel will be Marshall Harris III, who started the final 11 games last season. Harris must cut down on his turnovers to succeed in that role, and it’s key for the Bulldogs that he do so. There is no other obvious candidate to play the point, as DeVontae Wright transferred to USC-Aiken this summer. Moore could be an option, and one of the freshmen may get a look. Wright was one of three underclassmen to transfer after last season. Jordan Robertson, a forward who showed flashes of potential last year, is now at Davidson County Community College. He was the only one of last year’s group of freshmen to leave. The third player to transfer, Barry Smith, moved on to Bethune-Cookman. The two seniors on last year’s team, Cosmo Morabbi and Bo Holston, both graduated. Holston had one year of athletic eligibility remaining, and elected to play as a graduate student at Anderson. In all, players no longer on the roster accounted for 42% of the minutes played last season. There are seven players on this year’s roster who have yet to appear in a Division I game — four incoming freshmen, two redshirt freshmen, and a fifth-year transfer student. The most heralded of the “knobs” is Matt Van Scyoc, a 6’6″ wing player who led the state of Wisconsin in three-point shooting last year. Van Scyoc averaged 24.3 points and 13.3 rebounds per game his senior season and was an all-state selection in Wisconsin’s Division 5 high school classification. His fellow classmates include 6’3″ swingman Raemond Robinson, a Goose Creek product who was also an outstanding high school football player. Robinson is used to winning, both on the gridiron and on the court; perhaps he can bring that kind of positive energy to The Citadel’s hoops squad (much like John Brown did during that aforementioned 2008-09 campaign). Janeil Jenkins and Quinton Marshall each signed late in the spring. They are both guards, but of markedly different sizes; Jenkins is 5’10”, while Marshall is 6’5″. Chuck Driesell mentioned Marshall in a recent interview with Jeff Hartsell of The Post and Courier as someone who might get to play early. Two of the eight freshmen from last year did not see any action in 2011-12. Dylen Setzekorn is a 6’7″ wing on the slender side (194 lbs., per The Citadel’s website). 6’9″ forward Michael Hundley is even thinner (180 lbs.). It is easy to see why both were redshirted. Hundley has a reputation as a shotblocker. If he could get on the court with that skill, it would be a huge boon for The Citadel, which hasn’t had a true shot-swatter since Kirill Misyuchenko patrolled the lane for the Bulldogs in the late 1990s. The final player on The Citadel’s roster is something of a wild card. Stephen Elmore is a 6’6″, 220-lb. graduate student who saw limited action at Princeton…as a baseball player. The 2012-13 campaign will be his first (and last) taste of college basketball, at least as a player. He is the son of Len Elmore, the well-known college basketball commentator who was an outstanding college player at Maryland (and who had a solid NBA career as well). Driesell described Stephen Elmore as “a power forward who can shoot the three-pointer”. I have no idea what kind of impact (if any) he will have for the Bulldogs. The Citadel’s non-league slate is about what you would expect for a team that only won six games a year ago and includes two games against non-Division I competition. The Bulldogs will open the season by hosting the All-Military Classic, which also features VMI, Army, and Air Force. The Citadel squares off with VMI in its first game, on the same day the Bulldogs play the Keydets in football — in Lexington, VA. It’s a scheduling quirk that I think is unfortunate. There are no home games in December, which is a little strange. The Citadel is playing “guarantee games” against Georgia Tech, Clemson, and…St. Bonaventure. I’m not sure why the Bulldogs are making the trip to Olean, New York, but at least Andrew Nicholson has moved on to the NBA. In what I believe is a first, The Citadel is participating in Bracketbusters this season. Other out of conference games include a home contest against Radford and road games versus Charleston Southern and Gardner-Webb. I will be curious to see how Chuck Driesell handles tempo this season. Driesell prefers a faster pace than that implemented at The Citadel by Ed Conroy, but he was forced to slow things down last season in an effort to stay competitive. In that respect, he succeeded. The Citadel’s two late-season victories over Chattanooga and Appalachian State featured fewer possessions than any other games the Bulldogs played during the season. I think a slower tempo is generally what works best for The Citadel, but it’s obviously not a style Driesell really enjoys, and I don’t know what his approach will be this year. His best player (Groselle) is probably best suited for games with a more restrained pace. It’s just one of many things that makes this season for The Citadel a very interesting one. I’m not predicting a year like the 2008-09 campaign, but I believe the Bulldogs are going to surprise some people. The team has to make the leap from being competitive to winning games. It’s a difficult transition, but I think the talent is there to make that jump.